328 Commonwealth is located on the south side of Commonwealth, between Hereford and Massachusetts Avenue, with 326 Commonwealth to the east and 330 Commonwealth to the west. 328 Commonwealth was designed by Winslow and Wetherell, architects, and built in 1889 by W. A. and H. A. Root, masons, as the home of Isaac Parker Townsend Edmands and his wife, Maria S. (Hathorne) Edmands. He is shown as the owner of 328 Commonwealth on the original building permit application, dated February 26, 1889, and on the final building inspection report, dated December 28, 1889 (a floor plan, probably of the second floor, is bound with the building inspection report, located in the Boston Public Library’s Arts Department). The land on which 328 Commonwealth was built was purchased by Isaac Edmands on November 7, 1888, from James S. Gill, the eastern half of a parcel James Gill had purchased on February 23, 1886, from Elizabeth F. Brigham (330 Commonwealth was built on the western half of the lot). The lot was part of a larger tract originally purchased from the Boston Water Power Company on December 16, 1870, by lumber dealer David Nelson Skillings of Winchester as trustee for a trust composed of himself, Lawrence Barnes of Burlington, Vermont, Charles Whitney of Lowell, and David Whitney, Jr., of Detroit. The eastern boundary of the tract purchased by David Skillings marked the line between land originally owned by the Boston Water Power Company to the west and land originally owned by the Sears family to the east. 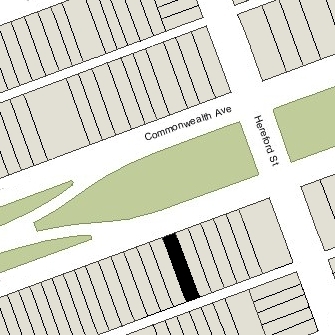 The boundary ran southwest from Commonwealth at approximately a 45 degree angle parallel to the former Parker Street (Cross Dam) further to the west. The land to the east of this angled boundary was acquired from the Sears family on January 2, 1871, by Nathan Matthews, changed hands, and was purchased by John Worster on October 22, 1877. On December 17, 1878, David Skillings and John Worster exchanged triangular shaped lots to “square off” their respective holdings so that the north-south boundary ran in a straight line rather than at an angle. Click here for an index to the deeds for 328 Commonwealth, and click here for further information on the land on the south side of Commonwealth between Hereford and Massachusetts Avenue. The houses to the west of 328 Commonwealth had already been built and were numbered 328-358 Commonwealth, and the houses to the east, also already built, were numbered 316-326 Commonwealth. When Isaac Edmands’s house was completed, it was given the number 328 Commonwealth and the houses to the west were re-numbered 330-360 Commonwealth. 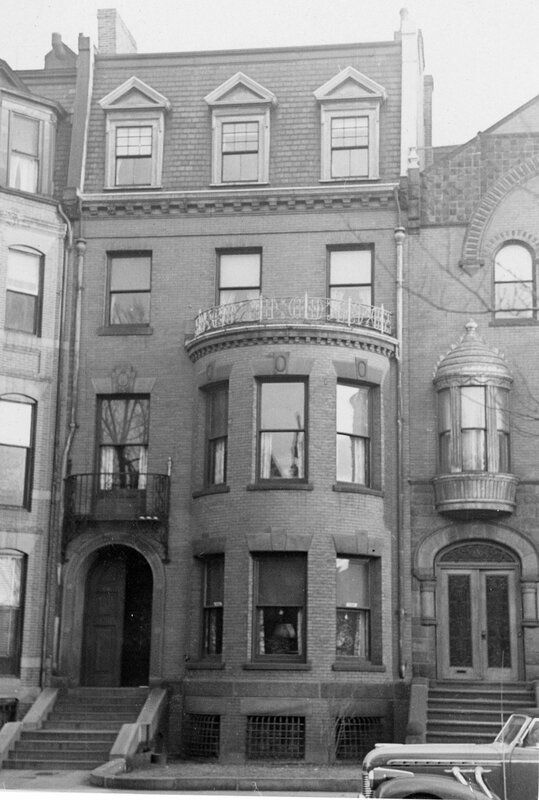 Probably as a result of this change in numbering, Bainbridge Bunting’s Houses of Boston’s Back Bay incorrectly reverses the information for 328 and 330 Commonwealth, indicating that the house now numbered 328 Commonwealth was built in 1888 and designed by O. H. Drisko (misread by Bunting as A. H. Drisko) and the house now numbered 330 Commonwealth was built in 1889 and designed by Winslow and Wetherell. By the 1889-1890 winter season, Isaac and Maria Edmands had made 328 Commonwealth their home. 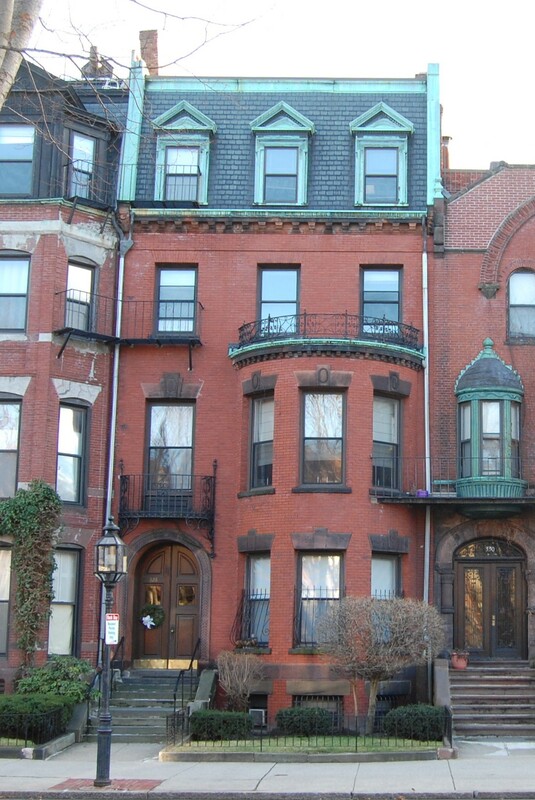 They previously had lived at 48 Monument Square in Charlestown. Isaac Edmands was an importer and wholesale dealer in hides, in partnership with Edward S. Barrett of Concord. He also was president of the Boston, Revere Beach & Lynn Railroad and later would become treasurer of the Canton Manufacturing and Bleaching Company. Maria Edmands’s father, Jacob H. Hathorne, lived with them at 328 Commonwealth. Also living with them was Charles J. Green, a dealer in morocco leather. He also had lived with them in Charlestown. On December 2, 1893, Isaac Edmands’s firm was declared insolvent as the result of the failure of the New York leather importing firm of Stein & Company, for whom Edmands & Barrett had co-signed loans. On September 3, 1893, Isaac Edmands had transferred 328 Commonwealth and other property to George H. Balkam, a New York attorney. The transfers — which were not recorded until December 2, 1893 — were held in abeyance until resolution of litigation brought by Edmands & Barrett’s creditors. At about this time, Isaac and Maria Edmands and Jacob Hathorne moved to Brookline, where Jacob Hathorne died in 1898 and Isaac Edmands died in 1899. 328 Commonwealth was not listed in the 1895 Blue Book. On April 16, 1894, Charles C. Barry, foreclosed a mortgage he held on 328 Commonwealth. During the 1895-1896 winter season, 328 Commonwealth was the home of Mr. and Mrs. A. J. Quinn. In 1896, 328 Commonwealth was the home of retail clothing merchant George Washington Simmons, Jr., and his wife, Mary Hamilton (Parker) Simmons. They previously had lived at 244 Marlborough. They also maintained a home in Nahant. They moved from 328 Commonwealth by mid-1897 (he died in February of 1898 at their Nahant home, the victim of “gun shot wounds in the chest” which were deemed to be accidental). On February 11, 1897, the court-appointed assignees of Isaac Edmands’s property transferred 328 Commonwealth to George Balkam. On February 13, 1897, Charles Barry assigned the mortgage on the property to George Rudolf Mosle of New York City. And on April 28 and April 30, 1897, Malcolm McLoud acquired 328 Commonwealth from George Mosle and George Balkam. On May 4, 1897, 328 Commonwealth was purchased by Mary Q. Hatch, Lucy P. Hatch, and Maria E. Hatch, unmarried sisters who made it their home. Their unmarried brother, real estate auctioneer Edward Hatch, lived with them. 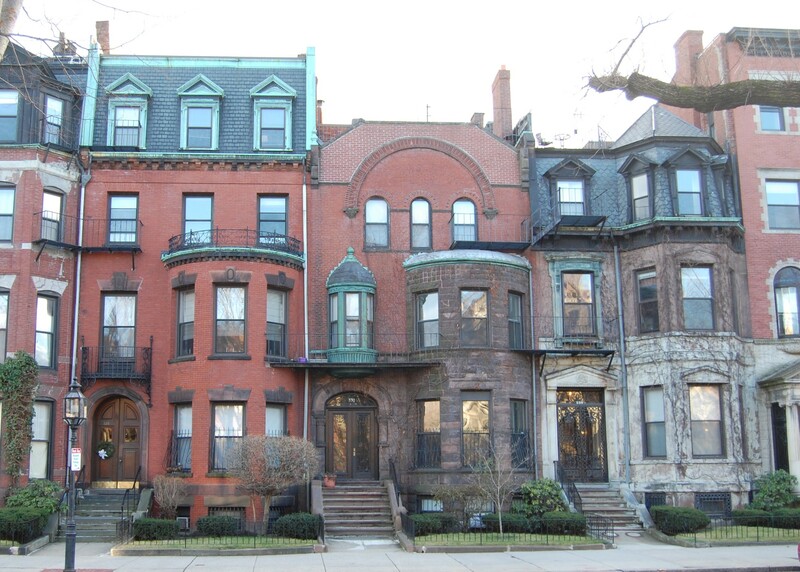 They all previously had lived at 261 Newbury. Mary Hatch died in March of 1900 and Edward Hatch died in March of 1910. Lucy and Maria Hatch continued to live at 328 Commonwealth. They also maintained a home in Marblehead. According to a July 14, 1940, Boston Globe article, the Misses Hatch kept their horse-drawn carriage until their deaths, riding in it throughout Boston and to Marblehead, and to weekly visits to the Vaudeville at Keith’s Theatre. Lucy Hatch died in October of 1926, and Maria Hatch died in November of 1926. In 1938, the trustees of Maria Hatch’s estate contributed the funds for construction of a music shell on the Storrow Memorial Embankment, the Hatch Shell, named in honor of her brother, Edward. 328 Commonwealth was not listed in the 1928-1937 Blue Books, and was shown as vacant in the 1930-1938 City Directories. During the period, the property changed hands several times, including twice going through foreclosure. By late 1938, it was owned by the Volunteer Cooperative Bank. In December of 1938, the bank filed for (and subsequently received) permission to install a fire escape, with the proposed occupancy of the property being a lodging house. The bank leased the property to Alice S. King, and in July of 1939, she applied for (and subsequently received) permission to convert the property from a single-family dwelling into a lodging house. On August 30, 1939, 328 Commonwealth was acquired from the Volunteer Cooperative Bank by Harry L. Cronan. The next day, he transferred the property to Mabel Blanche (Smith) Watters Cary, the wife of James Leroy Cary. The Carys lived at 328 Commonwealth and operated it as a lodging house. He was a salesman. They previously had lived in Millis. James Cary died in August of 1945, and Mabel Cary continued to live at 328 Commonwealth. In January of 1947, she applied for permission to convert the property from a lodging house into a fraternity meeting house and dormitory. She indicated that the property was to be owned by the Alpha Kappa Sigma Trust and rented to the Alpha Kappa Sigma fraternity of Northeastern University. The transaction apparently did not occur and she abandoned the permit. On March 18, 1947, 328 Commonwealth was acquired from Mabel Cary by Frances Willard (Hammond) Christian, widow of Dr. Andreas (Andrew) Forest Christian. She previously had lived at 20 Hereford, and lived briefly at 328 Commonwealth after acquiring it. She had moved by 1948, possibly to Santa Barbara, California, where she was living in the mid-1950s. On May 24, 1947, 328 Commonwealth was acquired from Frances Christian by Gladys M. Bishop, the wife of Alfred G. Bishop, a chauffeur. Alfred and Gladys Bishop lived at 328 Commonwealth and operated it as a lodging house. They previously had lived at 21 St. Botolph. On May 7, 1953, 328 Commonwealth was acquired from Gladys Bishop by Sarah Agnes (Tierney) Mayberry, the wife of William Joseph Mayberry. William and Sarah Mayberry lived at 328 Commonwealth and operated it as a lodging house. They previously had lived briefly at 204 Commonwealth and before that in Arlington. In November of 1953, Sarah Mayberry applied for permission to convert the property from a lodging house into a lodging house and one apartment. She subsequently abandoned the application, but refiled it in August of 1954, and subsequently received approval. The Mayberrys moved by 1955. On November 30, 1955, 328 Commonwealth was acquired from Sarah Mayberry by Anna Louise (Day) Hicks. Louise Day Hicks was a real estate investor and operator of lodging houses. She and her husband, John Edward Hicks, an engineer, lived in South Boston. She later would become a well known Boston politician. She was elected to the Boston School Committee in 1961 and was an outspoken opponent of using busing to integrate Boston’s schools. In 1967, she was an unsuccessful candidate for Mayor, but in 1969 was elected to the City Council. In 1970, she was elected to the US Congress, but was defeated for re-election in 1972. She was reelected to the City Council in 1973 and 1975, but then lost two successive bids in 1977 and 1981. On January 4, 1955, 328 Commonwealth was purchased from Anna Louise Hicks by Frederick Elmer Farnum, an optometrist, and his wife, Julia Frances (Smith) Farnum, a manufacturer’s representative. They lived at 328 Commonwealth and operated it as a lodging house. They previously had lived in Milton. They continued to live at 328 Commonwealth in 1965, but moved thereafter to 486 Commonwealth. On October 1, 1965, 328 Commonwealth was acquired from the Farnums by Jack Aifer. He already owned 334 Commonwealth, and subsequently acquired 330 Commonwealth, 336 Commonwealth, and 344 Commonwealth. On May 4, 1967, Robert White acquired 328 Commonwealth and Jack Aifer’s other four houses on the block. He already owned 324–326 Commonwealth and 348 Commonwealth. By December of 1978, he owned 322–324–326–328–330–332–334–336 Commonwealth, 344-346-348–350 Commonwealth, and 354–356–358–360 Commonwealth. In December of 1988, he applied for (and subsequently received) permission to convert 328 Commonwealth from a lodging house and one apartment into nine apartments. At the same time, he also applied for (and subsequently received) permission to combine it with 322-326 Commonwealth and 330-332-334 Commonwealth into one property with 63 apartments, to be known as 322-334 Commonwealth. 336 Commonwealth remained a separate property. 328 Commonwealth remained an apartment house in 2018.